Junior, a five-year-old draft cross. 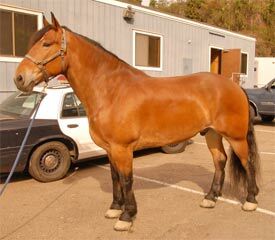 Bidding for one of seven San Diego police horses being auctioned online following the disbanding of the city's mounted unit has reached $US10,000. With four days still to run on the auctions, five-year-old 16.2-hand Junior has so far attracted 81 bids and stands at $US10,400. Bret, a 12-year-old, is at $US7500 after 64 bids, while 11-year-old Austin (55 bids) is at $US6700 and Wam, 13, with 45 bids, is at $US6650. Trigger, 15, has so far attracted 49 bids to reach $US5200, while Major, also 15, is at $US5500 after 54 bids. Bandit, 15, has attracted 39 bids to stand at $US4350. All the horses are geldings. The unit was disbanded as part of cost-cutting measures and the horses, as well as their tack and other equipment, are being sold on Publicsurplus.com. The unit began operating in 1983. Its officers have been assigned to other duties. Potential bidders were able to see the horses on February 4 at the police stables. No riding or handling was permitted.